Landscape architects, designers, and builders sometimes make a distinction between the terms walkway and pathway. Walkways are utilitarian paved surfaces used to facilitate foot traffic in a practical manner. They are often straight routes, usually made from hard paving materials. A pathway, on the other hand, can be considered a more recreational feature of a landscape, a meandering route, often made from casual, rustic materials. Pathways are appropriate for more natural settings, such as gardens, where they provide a means for enjoying landscape features at leisure. Walkways, on the other hand, tend to be all business—designed to move people from point A to point B with a minimum of fuss. The types of materials used to build pathways are typically different than those used to construct walkways. Natural materials such as loose gravel or mulch are common choices in pathways, whereas walkways are usually formed from stable hardscape materials, such as poured concrete, large slabs of mortared stone, or pavers. Although poured concrete is often the material of choice for walkways, pavers make for a much better walkway surface. 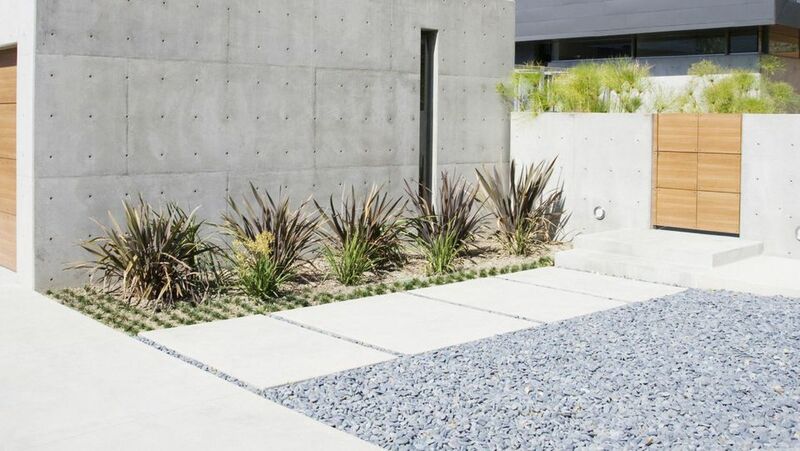 Made from tumbled concrete blocks, pavers look more natural than poured concrete and are available in various earth tones for better integration into the landscape. They also are immune to the cracking that can plague solid concrete walkways. If a paver is damaged, it is an easy matter to remove and replace it. A final foundational difference between walkways and pathways is their width. Walkways are typically 4 to 6 feet wide to allow for pedestrians to pass by one another, while pathways are usually 2 to 3 feet wide because they are used less often and by fewer people. Try to keep walkway design consistent. If you have a very formal home, symmetric lines may be best. Or, if you have a country-style home, consider using large flagstones for a more natural look. Homeowners need to keep in mind such details as weather conditions and potential uses for the walkway or path when discussing a project with their landscaper, as this may help determine what design principles are best for their space. In walkway construction, acid staining and stamping concrete have recently become very popular trends, offering cost-effective ways to beautify regular poured concrete. However, these methods will not last forever and often require yearly maintenance. Acid stains can be applied to pre-existing concrete, making this a cost-effective option for homeowners seeking to renovate existing concrete walkways. Acid staining is sometimes done successfully by DIYers. Another method of coloring concrete is dyeing. There are roughly 40 to 50 concrete dye colors from which to choose, but this process is most effective when it is mixed into large batches in a ready-mix truck. Large-scale dyeing is not practical for the DIYer. Stamping concrete is also best done by professionals. When choosing a color for stained or dyed concrete, match the walkway with the color of the house. Often, earth-tone colors provide a nice complement to the home’s exterior. When designing a pathway, make sure the colors are natural and blend with the surroundings. To maintain a good appearance when stamping or dyeing concrete, use a commercial sealer after completion. You can choose either a glossy or a dry look to enhance the color. A commercial sealer can also prevent mold and mildew buildup and help prevent weather from breaking down materials. Budget. The budget a homeowner has set aside for the project is the largest factor when selecting materials for a walkway or pathway, as cost dictates what materials are available to use. Shade. The amount of shade present is another determining factor when deciding which materials to use in walkways and pathways. Moss and mildew will accumulate on stone and concrete, causing a slippery, hazardous condition. Use trail mix—a natural mixture of aggregates—for pathways in shady areas for pathways. For walkways in shade, use pavers rather than poured concrete. Home construction. Look at the house’s colors and siding. Is it brick? Stucco? Wood siding? When developing a walkway, try to select a color that complements existing structures, but doesn’t match them exactly. For example, if your home has a brick exterior, select one tint found in the brick walls to include in the walkway. This is why earth tones are so popular—because they often complement traditional building materials. For pathways, this isn’t as difficult because you are often placing the pathway in a very natural setting between trees or in a garden. Shredded wood, gravel, and other natural materials often work best in these situations. Pathways and walkways create an extension of the home by making unusable places usable. While providing practical living value, these features can also increase real estate value. If done correctly, a quality pathway or walkway project made with good materials is a good investment. A poorly planned or executed walkway, on the other hand, could actually reduce the value of your home. A landscape designer can tell you whether the project is worth the potential cost. National averages can be used to estimate the costs of your walkway or pathway. Typically, a higher-end walkway or pathway will consist of custom cut stones and inserts, while a lower-end pathway is less complex, consisting of mulch or gravel. Often flagstones are selected for high-end walkways because they have to be custom fitted. Walkway pavers are also a popular choice among homeowners who are looking for a more formal, patterned walkway.